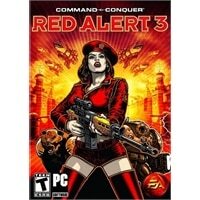 COMMAND & CONQUER RED ALERT 3 UP - PC Gaming - Electronic Software DownloadCommand and Conquer: Red Alert 3 from EA brings back the fan-favorite real-time strategy game in its latest incarnation with new features, powers, technologies, and a different world. Now, you can play not just by yourself but also cooperatively with a friend as you take on the enemy in this glorious, over-the-top romp. Command and Conquer: Red Alert 3 from EA brings back the fan-favorite real-time strategy game in its latest incarnation with new features, powers, technologies, and a different world. Now, you can play not just by yourself but also cooperatively with a friend as you take on the enemy in this glorious, over-the-top romp.